Cookbook author Martha Holmberg has written the book on crepes — literally! Her "Crêpes: 50 Savory and Sweet Recipes" is the definitive guide on how to make crepes filled with everything from cheese to chocolate. Here, she shared her step-by-step guide for how to make crepes. 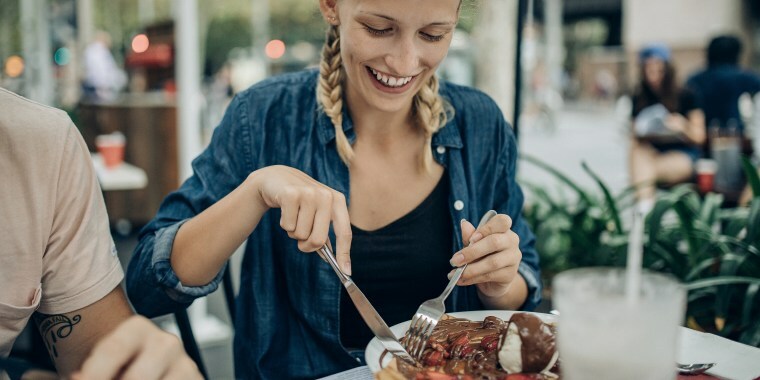 Crepes fit the bill for almost every eating occasion: breakfast, brunch, a quick afternoon treat, an hors d'oeuvres, a main course for a family (or fancy) dinner and desserts galore. People who are new to crepe-making should prepare to mess up their first crepe (or even more) because the real key to mastering crepes is patience. It may take a few tries, so don't get frustrated if the first few crepes are a touch wonky-looking. They'll still be delicious and will make a perfect cook's treat! A blender is a crepe-maker's best friend — it's brilliant at mixing the batter, without a lump in sight. Also, make sure to have a small ladle on hand, or anything that helps to deliver a consistent amount of batter to the pan while keeping fingers clean. As for the pan, there's no need for a fancy crepe maker to whip up beautiful crepes. It's possible to use just about any pan — an actual crepe pan, an omelet pan, or a plain old skillet — as long as it has a heavy, flat-bottom surface. It’s OK if the sides of the pan are curved, but the base of the pan should have the same diameter that's desired for the crepes. My go-to skillet is an 8-inch Calphalon stainless-steel pan, which is not nonstick. The heavy base delivers even heat, which is important for frying crepes. For a foolproof option, look for a good-quality nonstick skillet that feels heavy and well made. Even with nonstick, good heat distribution is important. Another option is a real French crepe pan made of blue steel (also sometimes called black steel). Making crepes with one is a lovely experience. This type of pan is inexpensive and can make people feel quite Parisian as they produce perfect, lacy crepes from this timeless-looking, bare-bones pan, the design of which probably hasn’t changed in 150 years. This type of pan needs to be seasoned before cooking starts, so read the instructions that come with it. And these pans will rust in a heartbeat, so be sure to dry them thoroughly after a gentle washing with hot water and a drop of dish soap. No dishwashers, please. Also, have a long offset spatula or a thin-bladed table knife on hand. It will be used to peek at the underside to see if it's browned and to flip the crepe — unless you're the type who likes to show off and flip food in the air. 2. Select the best ingredients possible. Most crepe recipes call for essentially the same ingredients: eggs, milk, flour, salt and butter. They're all ingredients that are likely already on hand, which is one more reason to love crepes. 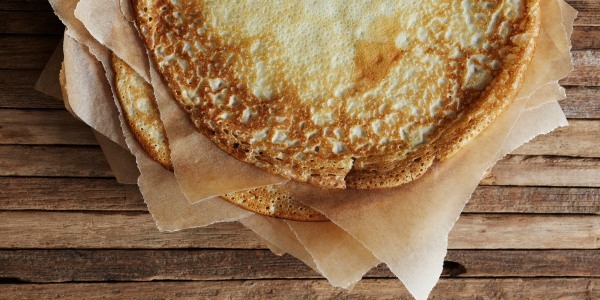 The choice of flour gives the crepe its distinctive character. Feel free to try all-purpose flour, whole-wheat pastry flour, buckwheat flour or gluten-free flours, like rice flour and chickpea flour. Since there are so few ingredients in crepes, the quality of each one plays a big role. Choose fresh large eggs and use fresh unsalted butter that hasn't been sitting in the fridge for a month oxidizing. 3. Blend the crepe batter. Blend together the milk, eggs and salt, then add the flour and blend again. The final ingredient to add is melted butter, preferably brown butter. If making dessert crepes, this is the point to add some sugar and vanilla extract to the batter. 4. Prep the crepe batter. Transfer the batter to a large glass measuring cup with a spout or a bowl that's large enough to easily dip a ¼-cup measuring cup into. Let the batter rest for at least 5 minutes and up to 24 hours. If resting for more than 30 minutes, store the batter in the fridge. Test the batter's consistency right before making the crepes. It should be as thick as heavy cream, but not as thick as pancake batter. If it feels too thick, whisk in a small amount of milk (a splash at a time) until the desired consistency is reached. 5. Prepare the crepe pan or nonstick pan. Heat the 8-inch pan over medium-high heat until it's hot enough to make a drop of water sizzle upon contact. Using a folded paper towel, spread butter around the interior of the pan. The butter should sizzle upon contact, but not instantly turn brown. The pan shouldn't be so hot that the butter burns. 6. Place batter in the pan. Pour about 1/4 cup of the batter into the center of the pan and, at the same time, lift the pan from the heat, tilting and turning it in all directions so the batter spreads evenly across the bottom of the pan in a thin circle. 7. Make sure the batter coats the pan in a thin layer. If the crepe has any holes in it, quickly add a few drops of batter to fill them in. Or, if there is too much batter and the crepe looks too thick, immediately pour the excess back into the measuring cup or bowl of batter. The "tail" that's left behind can always be trimmed off later. 8. Lift and flip the crepe. Cook the crepe until the edges begin to dry and lift from the sides of the pan, and the bottom is nicely browned, about 1 minute. To check for color, use a table knife or slim off-set spatula to lift up an edge of the crepe and look underneath. Experienced crepe makers can use their fingers to do this. When the first side is ready, gently slip the knife or offset spatula under the center of the crepe and lift it up (the crepe drapes over the sides of the knife or spatula), and then quickly flip it over and back onto the pan. Smooth out any folded edges or pleats and then cook until the center is firm and the second side is browned, too, about 20 seconds more. The first side is almost always much prettier and more evenly browned, while the second side tends to be more spotty. This may take many tries to perfect. Slide the crepe from the pan onto a large plate or cooling rack. Repeat with the remaining batter, adjusting the heat and wiping the pan with more butter. The crepes can be stacked on a plate as they're done. 10. Fill and fold the crepes. For savory crepes, try cheeses, meats and chicken, fresh vegetables and seafood like smoked salmon in the filling. 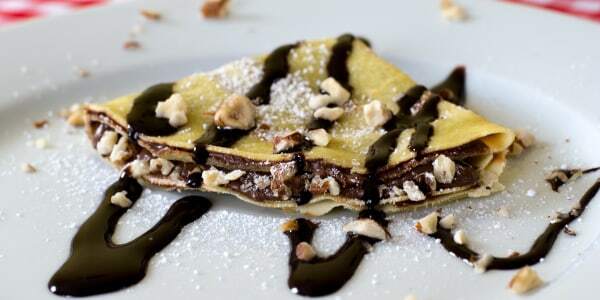 For sweet crepes, try chocolate, hazelnut spread, caramel, jams, compotes and fruits. There are many different ways to fold a crepe. It can be rolled into a simple cylinder, rolled and folded like a burrito, pleated like a galette and folded into a half-moon, a triangle, a rectangular flat-pack or a cone. Crepes can also be stacked into a cake with filling between each later. The cake is then cut into to reveal gorgeously striped wedges. Now that we've covered the basics, here are four delicious and easy crepe recipes to try, from savory to sweet. This standard batter can be used for so many crepe dishes, both savory and sweet. The incredible flavor in these crepes comes from the addition of brown butter, or beurre noisette in French, which means "hazelnut butter." It is an apt name because the milk solids in the butter get toasted into a lovely mellow nuttiness. 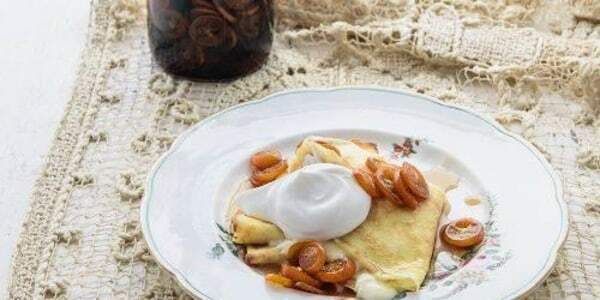 A chocolate-hazelnut spread, like Nutella, is delicious right off of the spoon, but it becomes a fabulous dessert when it's tucked inside a warm crepe that's sprinkled with chopped hazelnuts and topped with bourbon-scented whipped cream. Add on strawberries for an extra fresh touch. "Making crepes is actually really, really simple," celebrity chef Curtis Stone told TODAY Food. A smear of sweetened ricotta and a drizzle of syrup are the perfect finishing touches. Throw fresh herbs like chives into the batter to add extra flavor and texture. 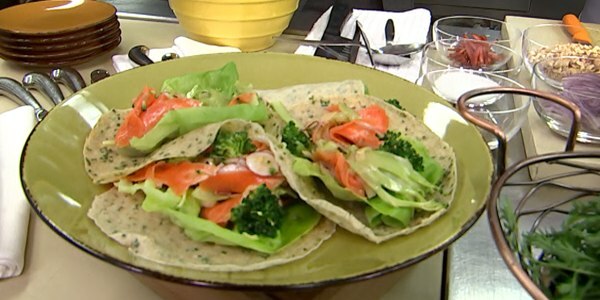 Whole wheat flour adds a boost of fiber to these savory crepes that are filled with crispy vegetables. Adapted and reprinted from "Crêpes: 50 Savory and Sweet Recipes" by Martha Holmberg with permission by Chronicle Books, 2012.